TEE TIMES are based on 10-minute intervals, with four player’s maximum per tee time. Players are requested to check in at least half an hour before their tee time. Most courses in Thailand are “spike free”, with no metal spikes allowed. NON-PLAYING GUESTS ARE NOT ALLOWED to accompany players. The club management and marshals operate in accordance with the Royal and Ancient of St. Andrews which governs the rules of golf at Banyan Golf Club. Local Rules are featured on the scorecard. USAGE OF GOLF CARTS & CADDIES Golf carts are optional 1 (one) golf cart per player and we recommend the caddie drives the cart. Carts are rented at your own risk and players are responsible for any damage caused. In order to maintain the condition of the golf course please observe any notices and comply with the instructions given on cart use by our Marshall’s. Golf cart rental fee is THB 750.- and are fitted with GPS. Caddies are mandatory in Thailand and the fee is THB.350.- it’s customary to tip your caddie after your round at THB.300.- None playing golfers may join if they rent a cart with a caddie. SEVERE WEATHER CONDITIONS In the event of severe weather conditions and you have played less than 50% of your round you may select another tee time and collect a ‘Rain Check’ from the Pro Shop. PUBLIC LIABILITY Banyan Golf Club, Hua Hin is not responsible or liable for any loss, damage to equipment or accident resulting in injury, disablement or death. 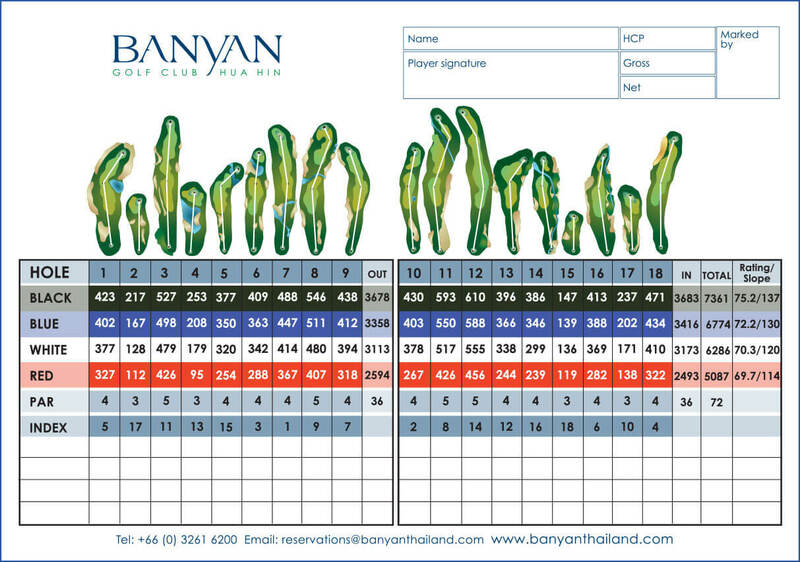 CADDY GRATUITY The aim of Banyan Golf Club is to provide you with a caddy to make your round of golf more enjoyable, fun and precise. It is customary to provide your caddy a gratuity at the end of the round no less than Bht.300 each. DRESS CODE Players must adhere to the dress code. The Club reserves the right to refuse admission to the course to any person considered inappropriately dressed.